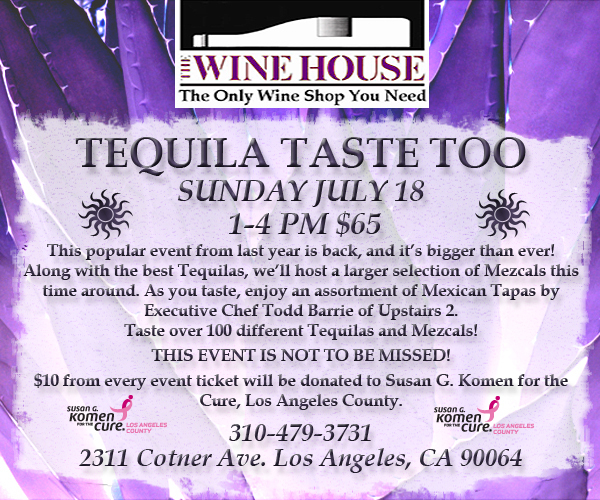 This Sunday, July 18, The Wine House presents Tequila Taste Too, an afternoon of agave featuring tastings of dozens of top tequilas, an expanded mezcal section, and cocktails (margaritas, caipirinhas, palomas). To pair with the libations, Executive Chef Todd Barrie will serve guests a variety of Mexican tapas. Tequila Taste Too will take place in Upstairs 2 (The Wine House’s restaurant and wine bar) and Addie’s Place, a smaller banquet room with a separate entrance. For this year’s event, $10 from every ticket will be donated to the L.A. County Affiliate of Susan G. Komen for the Cure, which raises funds to support local breast cancer services and national breast cancer research programs. According to Mark Schwarz (The Wine House Spirits Buyer), donating to medical research is important to The Wine House, and working with Komen’s L.A. County Affiliate means the funds raised will go to a local charity. Tickets to Tequila Taste Too are now available online. Capacity is limited, so buying presale tickets is strongly recommended.